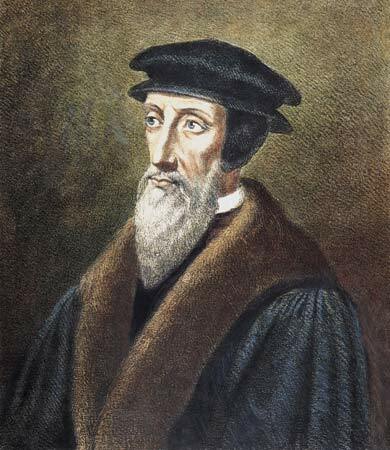 We here at The American Catholic, along with conservative Catholics in general, have been accused many times of “Calvinism” by certain writers at Vox Nova. I am going to go out on a limb and suggest that this accusation is nothing more than a massive projection made by people who harbor Calvinist theological assumptions themselves, of which they may or may not be fully aware. Particularly, I think in their constant shilling for big government programs, for slavishness before all forms of authority, for the unlimited extension of “rights” (i.e. entitlements), and the rest of the statist agenda, the leftists at Vox Nova and throughout American political landscape have absorbed a perverse Calvinist doctrine of their own, namely that of the total depravity of man. I have actually written about this before: the process by which radical leftism transformed from a project rooted in optimism, in a fanatical belief in man’s goodness and reason (apart from God of course), to one of utter pessimism and misanthropy. The first communists, and particularly Marx – for all of their deep flaws, errors, and hatreds – retained a belief in man’s goodness that they had mistakenly come to believe Christianity had rejected through the heresies of the Protestant rebellion. Friday, September 10, 2010 \AM\.\Fri\. I’ll begin by stating that part of the blame or praise for this post ought to go to Christopher Blosser and David Jones for their excellent overview and commentary on the ongoing political/economic dispute between Catholic Distributists and Catholic libertarians. I wish I could easily come up with a logical, smooth flow to all of these points. But really I just want to get them out there, no matter how disjointed in appearance. Finally, I really mean it this time: we will have a respectful discussion on this topic, or none at all. That means certain people and their comments will likely be banned from the discussion. It will not be possible to avoid charges of “being afraid” to debate with such indestructible champions of the one true political philosophy, given their amazing ability to rule out all other possible reasons, including their coarse and offensive personal behavior, as to why no one wishes to engage in discussions with them. C’est la vie. The best way to contribute here, though, is to ask questions that I can answer for this FAQ! Where does the word “Distributarian” come from? The word “Distributarian” was pejoratively applied to me and a few others who have attempted to blend libertarian and Distributist ideas by those not so enamored with the project. Since I see it as a good thing, I don’t mind wearing the label as a badge of honor. It is one who does not see a necessary conflict between the basic propositions of Distributism and libertarianism, and insofar as possible, seeks to incorporate both of them into their social vision. Of Distributism: property should be as widely distributed as possible. Of libertarianism: social relationships should be as voluntary as possible. Naturally some doctrinaires will dislike the wording “as ___ as possible”; why should we care about what is possible when great ideas are at stake? Either they exist full-fledged without imperfection in the world or they may as well not exist at all! If we move past this childish expectation and begin with the possible, I think we will find that there is no contradiction between these propositions. Distributism and libertarianism challenge each other in a good way. Distributism challenges libertarianism to move beyond individual autonomy and articulate a vision of the common good; libertarianism challenges Distributism to clearly articulate how property distribution ought to come about – through force, or through consent? Not only do they challenge each other; they compliment each other. Property owners will thrive in an environment of economic freedom; genuine liberty will thrive as it is rooted in solid social institutions based upon private property. As property ownership will increase the self-sufficiency of individuals, families, and communities, it will decrease dependency upon the state. Read the rest and comment here. And please note that this is a work in progress! Perhaps one of the most cherished freedoms of liberal democracy (in the sense of classical liberalism, not modern progressivism) is the freedom of religion. Much though I admire many elements of Western Civilization prior to the modern era, I cannot help thinking that the end of the formal confessional state has generally been a good thing not only for the state, but even more so for the Church. It has given the Church, no longer tied down by the need to support explicitly Catholic regimes, the freedom to speak more openly and forcefully on the demands that Christ’s message puts upon us in the public and economic realms. That said, it seems to me that there is a built in contradiction in the place of religious freedom in classical liberalism: While religious freedom is a central element of classical liberalism, the ability of a state to function as a liberal democracy will collapse if a large majority of the population do not share a common basic moral and philosophical (and thus by implication theological) worldview. Thus, while religious freedom is a foundational element of classical liberalism, only a certain degree of religious conformity makes it possible. Tuesday, December 15, 2009 \AM\.\Tue\. Since 2002 Ken Masugi, a senior fellow of the Claremont Institute and lecturer in Government at Johns Hopkins University, Washington DC, has conducted Advent interviews with James V. Schall, S.J., author of over thirty books on political theory and theology. Fr. Schall teaches in the Government Department of Georgetown University. The interviews themselves are a delight to read and span a variety of topics from current events to the pontificate of Pope Benedict XVI to issues in philosophy, theology and ethics — and sometimes, in addition, what books Fr. Schall himself is reading at that particular moment in time.